Lovely card Nina. A pretty mix of DSP (love the floral paper) and a great sentiment. Lovely background paper Nina. So pretty. Hope you have a great week. Great paper combo, Nina - so fun that the sentiment has an ornament with it!! Lovely card, Nina. Perfect combo of papers, and the little ornament is so sweet! What a sweet card! That little sentiment is just as sweet as can be! I love the background, too! Love the DSP you used Nina, and your sweet little ornament. 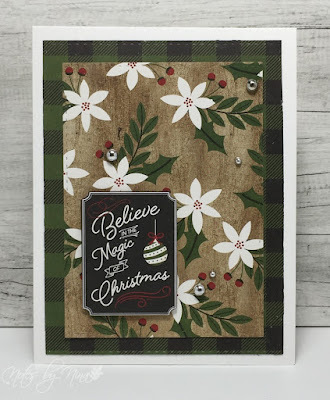 Nina, I always love how you use the perfect combo of patterned papers to design such beautiful cards. I love your take on the challenge this week. Hope your enjoying your week. A wonderful combination! 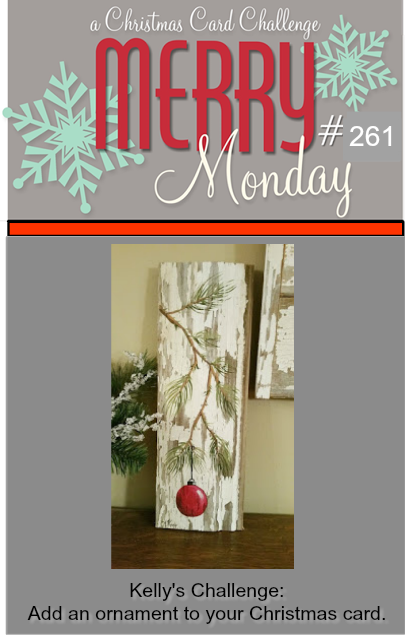 Very woodsy Christmasey! Beautiful! Love the rustic(ish) feel to your card Nina! And those added silver bits are perfect! OK... you fooled me... I thought you had stamped the background! Great card! Really gorgoeus pairings!!! Love the chalkboard/sign type and country feel!! I'm always impressed when you emboss on dark cardstock. Its so effective. Tasteful!